Orville is keeping country music alive and well in Manhattan. 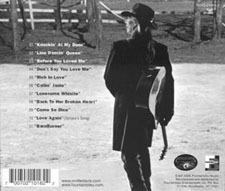 The title tune to his new CD is a fine, classic-sounding hillbilly bopper with stuttering steel and brushed drums. Elsewhere, he offers the fine ballad "Before You Loved Me," the rockabilly rave-up "Callin' Janie," the honky tonkin' "Don't Say You Love Me" and the sentimental "Rich In Love." One constant is that he's hard-core Country. BarnBurner's opener, "Knockin' At My Door," is heaven to a two-stepper's ears. This is quintessential classic country shuffle: you can see the pianist's left-hand dancing the bass line, the rhythm section could teach cows how to swing, the pedal steel pirouettes in just the right places, the short fiddle break is better than any since FM broke onto the scene, and Davis' voice, ah, Davis' voice. 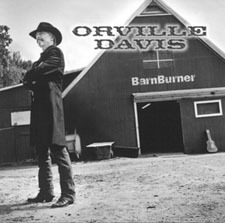 Take the smooth of Don Williams, the swoon of Glen Campbell, the stamp of authority of George Jones and the confidence of Merle Haggard and you're on your way to singing like Orville Davis.... BarnBurner is an astounding success. He may hail from New York, but Orville Davis' heart and his music have deep-seated rural ties and leanings. Barnburner (Fountainbleu) covers the basic country lyric arena in fine form, from heartache and loss tunes ("Don't Say You Love Me," "Back To Her Broken Heart") to more upbeat fare ("Line Dancin' Queen," "Knockin' At My Door") and reflective items ("Lonesome Whistle," "Before You Loved Me.") There are no unnecessary flourishes, wasted effects or artifice in Davis' singing either. It's just direct, simple and earnest, and the arrangements and sensibility are resolutely traditional. These numbers are probably a bit too raw for mainstream country radio, but anyone who wants to hear the genuine article will enjoy every number on Barnburner.